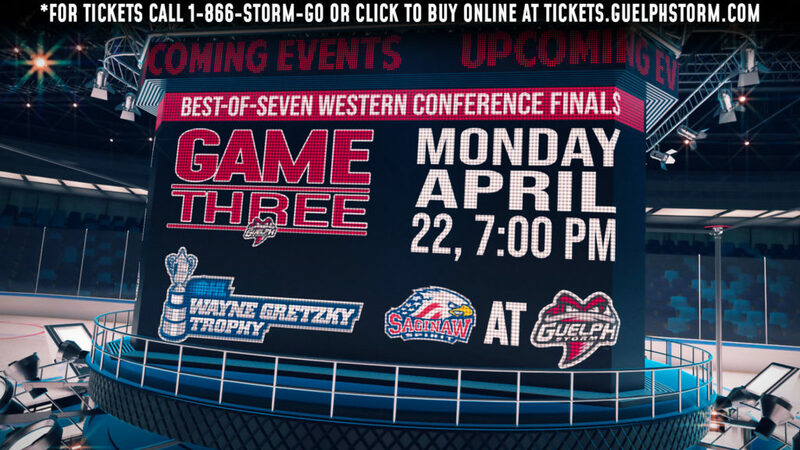 Following a tough opening weekend to their 2017/18 season, the Guelph Storm returned to the Sleeman Centre to face the Oshawa Generals in their second home game of the year on Friday night. Aiming to notch their first win of the year, three Storm veterans tallied their first goals of the young season. Liam Stevens, Isaac Ratcliffe and captain Garrett McFadden found the back of the net as the Storm toppled Oshawa 5-4 for their first win of the season. Anthony Popovich was once again tabbed with goaltending duties for the Storm and stopped 36 of 40 shots, while the Oshawa duo of Logan Gauthier and Kyle Keyser turned away 17 of 22 Guelph chances. 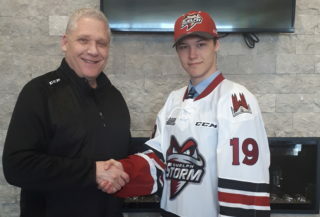 The game didn’t start out the way the Storm had hoped it would as just six minutes in, Oshawa rookie Nick Wong put a shot past Popovich to give the Generals the 1-0 lead. Responding quickly though, with just over a minute later on the power play, McFadden took a pass from Ryan Merkley and fired his first goal of the season past Gauthier to knot the game at one. The tie didn’t last long, with the Storm jumping ahead 2-1 after Stevens potted the rebound off a Mason Primeau. After killing off three separate penalties, Philadelphia Flyers draft pick, Ratcliffe, fired a wrist shot top shelf via a Cam Hillis drop pass to extend Guelph’s lead to 3-1 heading into the first intermission. The Generals came out hungry for the second period, clawing back to tie the game after goals by Danil Antropov and Nick Wong under four minutes apart. Despite losing the two goal lead, the Storm continued to respond, as just over a minute after the Generals tied the game, Alexei Toropchenko put Guelph back up by one, taking a pass from fellow countryman Dimitri Samorukov. The Moscow, Russia native added his second of the night with just 59 seconds remaining in the second, finishing off a spectacular passing display by the Storm power play. The St. Louis Blues draft pick ripped a one timer off Cam Hillis to bring the Storm lead to two heading into the third period. 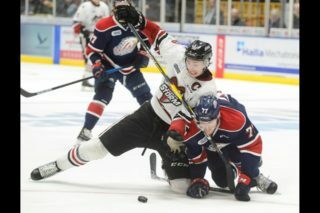 As the game shifted to the final period, Oshawa came out looking to mount a comeback. However, despite outshooting Guelph 14-5, the Storm only allowed one goal from Oshawa’s Antropov as Guelph held on for a 5-4 win. 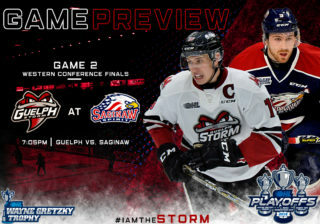 The Storm are back in action on Saturday, visiting the Saginaw Spirit for a 7:05pm puck drop. 1st Period-1, Oshawa, Wong 4 (MacLean, Kohn), 5:36. 2, Guelph, McFadden 1 (Merkley, Ratcliffe), 6:48 (PP). 3, Guelph, Stevens 1 (Primeau, Deakin-Poot), 9:22. 4, Guelph, Ratcliffe 1 (Hillis, Toropchenko), 15:40. Penalties-Hotchkiss Gue (slashing), 2:15; Henderson Osh (slashing), 6:42; Bertuzzi Gue (slashing), 13:04; Hillis Gue (slashing), 14:25. 2nd Period-5, Oshawa, Antropov 2 (McShane, Krastenbergs), 10:46. 6, Oshawa, Wong 5 (Studnicka, Brassard), 15:21 (PP). 7, Guelph, Toropchenko 2 (Samorukov), 16:29. 8, Guelph, Toropchenko 3 (Hillis, Merkley), 19:01 (PP). Penalties-Krastenbergs Osh (slashing), 7:33; Brassard Osh (cross checking), 9:29; Hotchkiss Gue (roughing), 9:29; Shoemaker Gue (match-slew foot), 11:14; Hillis Gue (hooking), 14:36; Antropov Osh (slashing), 18:12. 3rd Period-9, Oshawa, Antropov 3 (Noel), 14:02. Penalties-served by Hotchkiss Gue (too many men), 10:24; Commisso Osh (roughing), 15:38; Bertuzzi Gue (slashing, roughing), 15:38; Stillman Osh (interference), 18:37. Shots on Goal-Oshawa 11-15-14-40. Guelph 7-10-5-22. Power Play Opportunities-Oshawa 1 / 7; Guelph 2 / 4. Goalies-Oshawa, Gauthier 0-1-0-0 (17 shots-12 saves); Keyser 2-1-0-0 (5 shots-5 saves). Guelph, Popovich 1-1-0-1 (40 shots-36 saves). Referees-Sean Reid (26), Chris Carnegie (44). Linesmen-Dustin McCrank (68), Mac Nichol (93).